While you might think a family member can help care for you as you age, consider this: Caring for a loved one often forces these caregivers to take time away from their jobs and families and deal with high levels of stress. See some of the other surprising costs of family caregiving in this infographic. 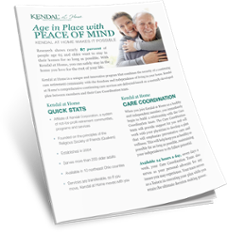 Research shows nearly 87 percent of people age 65 and older want to stay in their homes for as long as possible. See how Kendal at Home makes this possible. Being happy is one of life’s ultimate achievements, but in today’s world, finding and holding happiness often seems easier said than done. 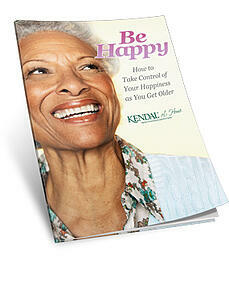 Learn why older adults should make happiness a priority and ways you can take control of your happiness today! 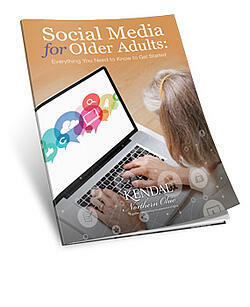 Many older adults have discovered the benefits of joining social media. Have you? This eBook provides helpful information about getting started with Facebook, Twitter, and Google+. For many older adults, falls happen in the place they feel safest: the home. 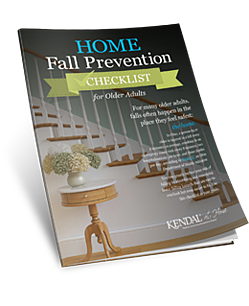 Download this checklist to find out how to reduce your risk of falling.